These 12 position clip strips are perfect for hanging and displaying small lightweight products. A label area located at the top can display a sticker/label promoting your brand and product information in-stores. 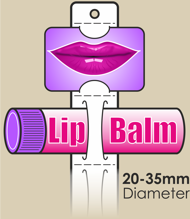 Suggested label size 3cm x 5cm (H x W). 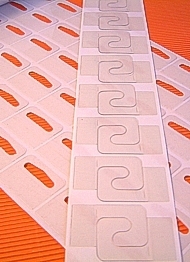 12 position clip strips made from 600 micron polypropylene. 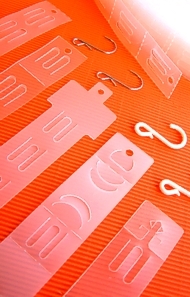 Our standard clip strips are used for hanging and displaying your retail products in stores. These clip strips hang and display cylinder shaped products horizontally with the option of having a Sticker / Label, promoting your brand and product information. These clip strips hang and display products with the option of having a Display Card in place, promoting your brand and product information. Maximum height for clip strip display card slots = 5.5cm. When you purchase 1'000 pieces of our NAKWIK09 design, we can print high quality display cards, starting from £50 / 1'000. Our design team will create the layout free of charge. Please call for this service: 01243 672267.